The summer isn’t over and already the fires have been terrible. What is causing all this trouble? 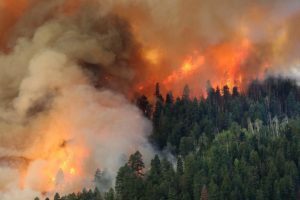 We had the huge 416 fire just north of Durango. Over 54,000 acres of our precious land has burnt in this fire alone, and there are many other wildfires near by. The 416 was terrible because it was so close to Durango, and because it was apparently started by an ember from our beloved Durango and Silverton Railroad. Much of the American Southwest is experiencing exceptionally dry conditions. I recently discovered that there are four levels of drought, according to National Integrated Drought Information System (www.drought.gov). Much of the Southwest is at the worst level—Exceptional Drought. Unfortunately, we are not alone. My wife and I recently traveled in Scotland and Norway. It was dry everywhere, with brown replacing the usual green. We didn’t need warm clothes the we packed since we were well inside the Arctic Circle. We wandered around the North Cape of Norway—the farthest north of that northern country—with only light jackets. Greece has suffered from disastrous fires, with the loss of many lives. Even northern Sweden is suffering from wildfires, which is very unusual. What is causing this hellish inferno? Of course, part of the answer is global climate change, which I like to call “global weirding” because different places get hit in different ways. While we are suffering from drought, the Northeast has been inundated with floods. Not all people are affected by climate change equally. The far north is heating up faster than the tropics. Poor people also get the brunt of this weirding—they are more likely to work outside or to live in high density cities with the “heat island” effect. On the other hand, the fortunate among us can resort to air conditioning. However, AC is counterproductive in the long run since most electricity is generated with fossil fuels. What can be done to slow climate change? In the short run reducing carbon emissions will help. We donate to offset our carbon emissions to organizations such as American Forests. Having small families is the best way to reduce carbon emissions for the long run. That is because each additional person added to the population increases carbon emissions—the fewer people, the less greenhouse gases. If you look at all the future generations that are likely to follow a child born today, the effect of having one fewer child is huge. Last year Fort Lewis College hosted a symposium on the science of climate change. We were hoping to have 200 people attend and were pleased that there were almost double that number! Most impressive was the teacher of a high school environmental studies class in Cortez who brought her students. Encouraged by such a good response to last year’s meeting, I am helping to organize a second event—“Climate Change Solutions”. It will be held at Fort Lewis College on October 30th. Please save the date! There will be an amazing lineup of speakers, two of whom will decrease their carbon footprints by appearing digitally. Senator Michael Bennet’s staff—or perhaps the senator himself—will be there in person. The senator is not campaigning for office this year but will update us on what is happening in Washington and Colorado to slow climate change. We will have a return visit from philosopher Travis Rieder who gave a wonderful Lifelong Learning talk last year on the ethical imperative of small families. Dr. Katharine Hayhoe is a climate scientist and member of the Nobel Prize winning International Panel on Climate Change. She and Dr. Karin Kirk, a member of the Yale Climate Connections, will be focusing on communicating about climate change. Climate Change Solutions will have two sessions that Tuesday—one in the afternoon and one in the evening. Both will be open to anyone, but the afternoon is especially for students; we are arranging for 380 students from local high schools to attend. After all, it is they who will suffer the most from climate change. We won’t solve climate weirding at this symposium, but people can learn ways to slow it down. You are currently browsing the Population Matters weblog archives for August, 2018.